In partnership with several other professional associations of physical scientists, the American Astronomical Society (AAS) has received funding from the National Science Foundation (NSF) to strengthen US science, technology, engineering and mathematics (STEM) by broadening the participation of underrepresented groups. The NSF announced the award today, 6 September, from its INCLUDES program, Inclusion across the Nation of Communities of Learners of Underrepresented Discoverers in Engineering and Science. Participation by underrepresented racial and ethnic minorities and women in the physical sciences has never matched their representation in the nation’s population. Moreover, the fraction of such students earning doctorates drops dramatically compared with the fraction earning bachelor’s degrees. The Inclusive Graduate Education Network (IGEN) Alliance intends to erase this disparity by institutionalizing inclusive, evidence-based practices for selecting and training a diverse, innovative, and competitive scientific workforce. Led by the American Physical Society (APS) under principal investigator Theodore Hodapp, the IGEN Alliance also includes the AAS, American Chemical Society (ACS), American Geophysical Union (AGU), and Materials Research Society (MRS). Together these associations represent some 300,000 scientists and engineers. Partnering with numerous other STEM societies, organizations, corporations, and national laboratories, the IGEN Alliance will undertake initiatives that span the complete pathway through graduate education — from recruitment to professional employment. Components include catalyzing graduate enrollment through new application and review processes, sustaining that growth by enabling programs to create more inclusive graduate education environments, and improving the mentoring of students through the critical transitions from college to graduate school and into the workforce. Through such efforts the IGEN Alliance seeks nothing less than to achieve equity for underrepresented groups in doctoral degree attainment in the physical sciences. The success of the planned approach has already been demonstrated in physics through the APS Bridge Program and an NSF-funded IGEN pilot project. AAS member Keivan Stassun, a professor of physics and astronomy at Vanderbilt University and an IGEN Alliance collaborator, is founding director of the Fisk-Vanderbilt Master’s to PhD Bridge Program, which has a stellar track record of helping women and minorities attain doctorates in physics, astronomy, and materials science. Two years ago Stassun helped convince the AAS to recommend that graduate programs eliminate or make optional the Graduate Record Exam (GRE) and Physics GRE as metrics of evaluation for graduate-school applicants. Research shows that these exams are poor predictors of student success, that their use in admissions has a particularly negative impact on underrepresented groups, and that they represent a financial burden for many students in pursuing advanced degrees in the astronomical sciences. Through its partnerships, the IGEN Alliance will work to expand initiatives like this across disciplines in the physical sciences to preserve the strengths of US graduate education while making it more broadly accessible. 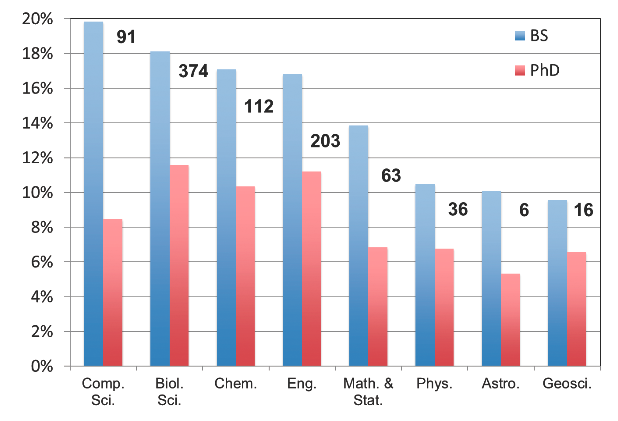 Current percentage of underrepresented ethnic and minority students earning bachelor’s (blue) and doctoral (red) degrees in various STEM fields each year. Numbers indicate the additional PhDs needed annually to erase the disparity between bachelor’s and doctoral degrees in each discipline. Courtesy the American Physical Society. "NSF INCLUDES Takes Major Step Forward with New Awards"
"New Alliance to Bolster Underrepresented Students in Graduate Programs in the Physical Sciences"
"ACS Part of New Alliance to Bolster Underrepresented Students in Physical Sciences"
"Materials Research Society Joins New Alliance for Equity in STEM Graduate Education"
The American Astronomical Society (AAS), established in 1899, is the major organization of professional astronomers in North America. The membership (approx. 7,500) also includes physicists, mathematicians, geologists, engineers, and others whose research interests lie within the broad spectrum of subjects now comprising contemporary astronomy. The mission of the AAS is to enhance and share humanity’s scientific understanding of the universe, which it achieves through publishing, meeting organization, education and outreach, and training and professional development.